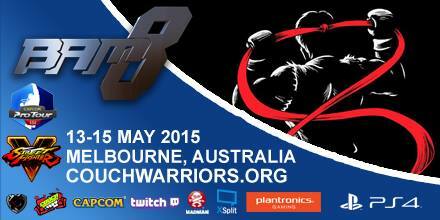 CouchWarriors Ranbats are back in June after a massive BAM8! We have traditional fighters and Melee: SF5, GGXRD, DOA5LR, MKX, Smash Melee and Project M on Saturday the 18th of June and Smash 4 and Rivals of Aether on the 25th of June. CW Traditional Fighters+Melee June 18 Ranbat – Preregister by making a Smash.GG account and visit here to register. CW Smash 4 June 25 Ranbat – Preregister by making a Smash.GG account and visit here to register. Hi guys, we’re very pleased to announce a partnership with Royal Stacks Brunswick- a joyous burger joint less than 300m (3min walk) from our ranbat venue on 6 Davies Street. The good folks at Royal Stacks Brunswick (800 Sydney Road) will give any of our ranbat attendees 25% off their order – simply show them the CouchWarriors ranbat event page on your smartphone-https://www.facebook.com/events/1612921805686485/ and they will apply the discount to your order! A big thank you to Deniz and the rest of the Royal Stacks staff, we know a lot of you guys already frequent this place for your ranbat sustenance so please make use of this offer and show your appreciation to the staff over there with a thank you if you have the chance!